In this work, Anderson Blanton illuminates how prayer, faith, and healing are intertwined with technologies of sound reproduction and material culture in the charismatic Christian worship of southern Appalachia. 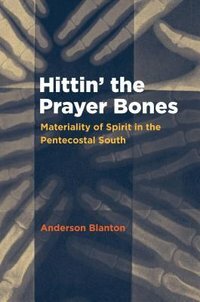 From the radios used to broadcast prayer to the curative faith cloths circulated through the postal system, material objects known as spirit-matter have become essential since the 1940s, Blanton argues, to the Pentecostal community's understanding and performances of faith. Hittin' the Prayer Bones draws on Blanton's extensive site visits with church congregations, radio preachers and their listeners inside and outside the broadcasting studios, and more than thirty years of recorded charismatic worship made available to him by a small Christian radio station. In documenting the transformation and consecration of everyday objects through performances of communal worship, healing prayer, and chanted preaching, Blanton frames his ethnographic research in the historiography of faith healing and prayer, as well as theoretical models of materiality and transcendence. At the same time, his work affectingly conveys the feelings of horror, healing, and humor that are unleashed in practitioners as they experience, in their own words, the sacred, healing presence of the Holy Ghost.